“Know your body and don’t ignore when something seems wrong,” breast cancer survivor Raynette Cameron advises. “It could be a headache – it could be a pain in your pinky toe – don’t ignore it,” she warns. Raynette knows first-hand. She noticed a lump near her collar-bone just days after being declared healthy following her annual wellness exam. She went back to the doctor immediately. The lump was stage-three breast cancer. After successful treatment, Raynette is hoping her story can encourage others to better manage their health and perhaps save their own lives. “We’re having too many people dying of breast cancer and when they look back they may have had a lump for two years and they just ignored it,” she says. “You don’t have to die from cancer. Early detection is the cure,” she says. But it’s not just for cancer, she says. People should pay attention to any sign of discomfort in their bodies and get it checked out. Uncharacteristic of many people, Raynette was very open about every step of her ordeal. “I was never quiet about my diagnoses. I posted my diagnoses three or four days after I found out,” she says. Facebook was where Raynette shared her highs and lows with family and friends. That openness has drawn many to Raynette, both for advice and support. “I’ve been holding some hands,” she says, explaining that she has accompanied several women to mammogram appointments. Others she has had to force, she says jokingly. “I dragged my sister to get a mammogram as soon as she turned 40,” Raynette remembers. Three of Raynette’s aunts are breast cancer survivors. And her paternal grandfather died of colon cancer. So she took no chances with her sister. “People are afraid that it (a mammogram) hurts,” she says. “But so what! It’s only for two seconds and it can save your life.” Raynette says four of her close friends and family have been diagnosed with breast cancer in the past year. She has since gotten genetic testing for “BRCA 1 and BRCA 2” also known as the breast cancer genes. The tests came back negative. 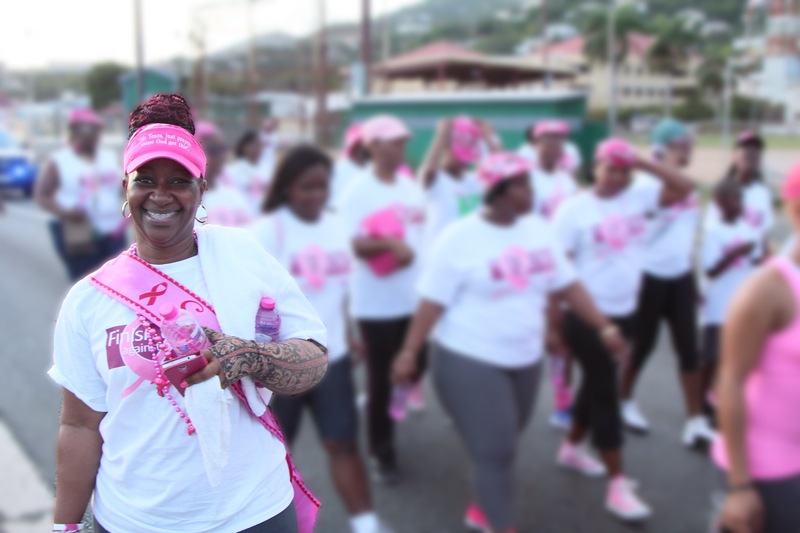 Now Raynette is focused on giving back, whether that means sharing her story, accompanying someone to a doctor’s visit or raising funds for the USVI chapter of the American Cancer Society (ACS). Proceeds from her “No Tears, Just Prayers, Cause God Got This,” branded products are donated to the ACS. What started as slogan that Raynette used to comfort her family following her diagnoses has turned into a noticeable brand. One day after undergoing a series of testing Raynette and her family were walking through a mall when her mother suggested that they inscribe the mantra on a baseball cap. Her father decided to make several of the caps so that his daughter could sport different colors after her chemo treatments. They were so cute that Raynette posted them on Facebook. The rest is history. She now sells branded hats, visors, head bands, t-shirts and other accessories. This October, in honor of Breast Cancer Awareness Month, Raynette also hosted another fundraiser. “I needed to make this fun and bring awareness,” she says. “This year I wanted it to be all about giving back.” The result was “Paint the Porch Pink,” a party on her patio where all invited guests wore pink. Over 50 people attended, including eight breast cancer survivors. Vendors were invited to sell their products and a percentage of all sales were donated to the ACS. Next October, Raynette says, the event will be open to the public at a larger venue. Her long-term goal is to establish the ‘Ray of Sunshine Foundation’ to bring about breast cancer awareness and to support people with the disease. In the meanwhile, Raynette continues to thank God, her family and her doctors. As part of her continued monitoring she must undergo screening every three months that includes chest x-rays, sonograms and lab work. “At my check up in September my doctors said, ‘You are a walking miracle.’ I never take that for granted,” she says, tears streaming down her face.